Mongolia and the Mongol people have periodically been at the center of international events. The histories of nations - indeed, of continents - have been rewritten and major cultural and political changes have occurred because of a virtual handful of seemingly remote pastoral nomads. The thirteenth-century accomplishments of Chinggis Khan in conquering a swath of the world from modern-day Korea to southern Russia and in invading deep into Europe, and the cultural achievements of his grandson, Khubilai Khan, in China are well-known in world history. The Mongol character has been greatly influenced by the extremes of Mongolia's geography, comprising huge rolling plateaus, rugged mountain ranges, and areas susceptible to earthquakes. 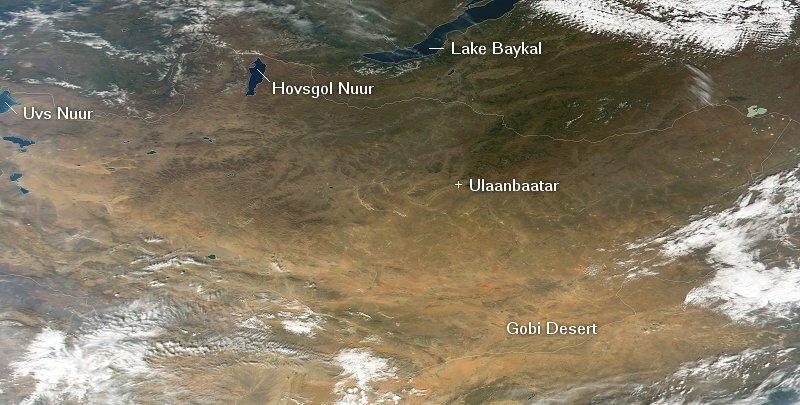 On the one hand Mongolia has Hovsgol Nuur - Asia's second largest freshwater lake - and river systems that drain toward the Arctic and Pacific oceans and into Central Asia, and on the other, the Gobi, a vast arid rangeland within which are even less hospitable desert areas. If you are planning to visit Mongolia you may be interested in having a quick look at the following photos. Click on the links below to view the pictures. We have taken any attempt to provide exact (GPS-based) coordinates of the positions where the photos have been taken. Mongolia from space. The political borders are drawn as a thin white line.